#16 Warwick Model – SOLD! 10flobx99	2017-10-09T19:43:55+00:00	Categories: Devonshire Place at Bermuda Bay, FLOBX, Florida Outer Banks Development, homes for sale outer banks, income properties outer banks, investment properties outer banks, Kill Devil Hills New Homes for sale, NC, OBX new homes for sale, Outer Banks Investment Properties, Outer Banks New Homes for Sale, Outer Banks Real Estate Sales, Single Floor Homes for sale Outer Banks|Comments Off on #16 Warwick Model – SOLD! Don’t Miss Your Chance to Own Your New, Maintenance-Free Outer Banks Home! 10flobx99	2017-08-03T21:02:05+00:00	Categories: Corolla Real Estate, Devonshire Place at Bermuda Bay, FLOBX, Florida Outer Banks Development, Homes for sale Corolla, homes for sale outer banks, income properties corolla, income properties outer banks, investment properties outer banks, Kill Devil Hills New Homes for sale, NC, new construction corolla, new construction corolla nc, New Homes for Sales Corolla, OBX new homes for sale, Outer Banks, Outer Banks Investment Properties, Outer Banks New Homes for Sale, Outer Banks Real Estate Sales, Single Floor Homes for sale Outer Banks|Comments Off on Beacon Villas is Sold Out! Only 13 Units Left at Devonshire Place! 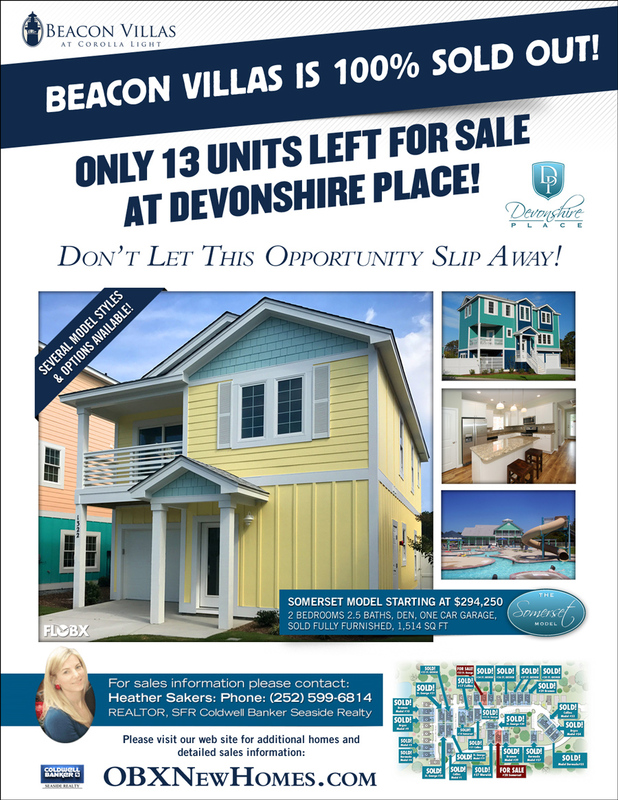 We may have sold out completely at Beacon Villas, but we 13 Units Left at Devonshire Place! Don’t miss your opportunity to own your piece of the Outer Banks, these are some of the fastest selling homes in an extremely active Outer Banks real estate market. Contact sales agent Heather Sakers at 252-599-6814, or visit our contact page. Summer is upon us and things are really heating up at Devonshire Place! 10flobx99	2017-07-05T23:08:24+00:00	Categories: Devonshire Place at Bermuda Bay, FLOBX, Florida Outer Banks Development, homes for sale outer banks, income properties corolla, income properties outer banks, investment properties outer banks, Kill Devil Hills New Homes for sale, NC, OBX new homes for sale, Outer Banks, Outer Banks Investment Properties, Outer Banks New Homes for Sale, Single Floor Homes for sale Outer Banks|Comments Off on Summer is upon us and things are really heating up at Devonshire Place! Summer is upon us and things are really heating up at Devonshire Place! Three homes sold in less than 2 weeks! Come see why Devonshire Place is the fastest selling development on the Outer Banks, contact Sales Agent Heather Sakers at (252) 599-6814, click here to email Heather.